Cowon JetAudio 8.1.5.10314 Plus | Free eBooks Download - EBOOKEE! Cowon JetAudio is integrated multimedia software composed of a single compact rack. Not only does it play various music and video files, but it also has other features such as CD burning, recording, conversion to other file formats, and so on. In addition to these features, you have the ability to create your own Internet broadcasting by using JetCast, which is provided with JetAudio. Play all major file formats and discs, including WAV, MP3, MP3Pro, OGG, WMA, MPG, AVI, WMV, MIDI, RM, and video, and audio CD. Convert among audio file formats, and record analog audio to various formats. 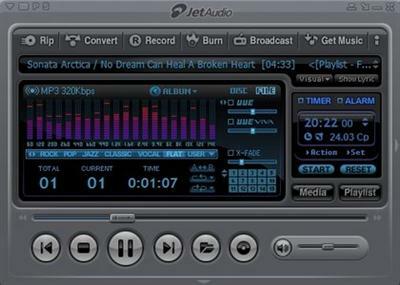 The program features Internet broadcasting with JetCast; visualization plug-ins, including Sound2Vision; tag editing for MP3, OGG, and WMA; various sound effects including wide, reverb, and x-bass; multichannel sound output; speed control of audio playback; crossfading for smooth transition between two songs; a skinnable user interface; synchronized lyrics display (karaoke) for MIDI and MP3 files; and subtitles. No comments for "Cowon JetAudio 8.1.5.10314 Plus".